One of my clients has a trifecta happening in his organizational branding. Three ministries, all located in Southern California! All three of these ministries are linked to my client, who requested the inclusion of Hebraic lettering to represent his ministry. The first entity is Fusion, which is an amazing ministry I might add. Back to the Hebrew lettering — if you are familiar with Hebrew you can find a Shin in the flame of the Fusion logo above. There is SO much to say about the Fusion mark, but I will just touch on the visual basics… In addition to the Shin, we have a matchstick, strike line, candle and flame (all in a sort of stained glass graphic style) that speaks to the “igniting” arm of the tagline. This logo was a collaboration with consultant Wayne Headley and I, and we felt truly blessed by this inspiration. After collaborating with Wayne on Fusion’s logo, I was asked to create another logo for a second entity — a congregation in Malibu. This logo had to include the Hebraic characteristic as well, so I incorporated the Ayin into the flame of the Ascend logo. I accompanied the flame with the cool blue waters of Malibu and an open, airy type treatment. Again, there is an entire document of inspiration with this logo, but you can catch the more obvious messages without my lengthy narrative. All of our proofing and consultation happened over email, phone, and text. You can imagine the amount of time and effort it takes to create a new logo, so adding the distance to that process was really challenging. We were successful after a few months of drafts and tweaks, so the Ascend Malibu logo you see has been launched! What’s next? We are hoping to develop a new look for the Los Angeles group, Ruach L.A.
Last week’s projects included an off-shoot logo for one of my favorite clients. Chef Darryl Dinning of Panachè Catering has been a great example to me over the past several years here in Nashville. His example of hard work and excellence is tremendous. 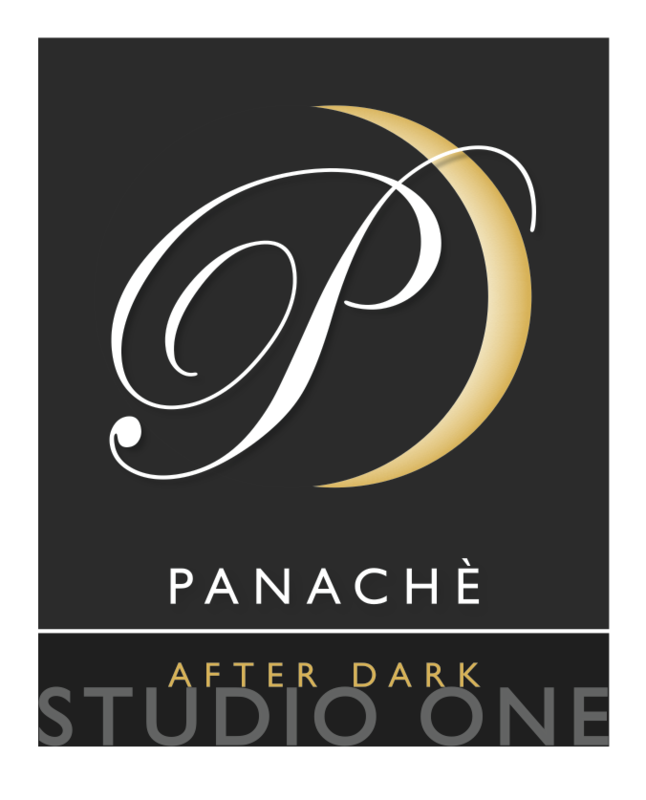 Chef Dinning requested a logo that contains elements of his current working logo, but represents his new venture, “Panachè After Dark / Studio One.” It is an urban event that will feature his culinary offerings in combination with a musical scene. You’ll see how I integrated the current color scheme (seen in the logo below) with the new offshoot. This direction shows a fingernail moon which pushes the “After Dark” theme, then we resonate with Studio One last. The Panachè “P” is used in almost all of the collateral that I design for them (in combination with a light weight line of a circle), as I find it to be one of the most elegant elements of their current logo. I did not design their current web site. The original logo was created by another designer several years ago. Since then, I have been Panachè’s primary designer, integrating this logo into print pieces, web files, menus, business cards, etc. I have made a few minor adjustments after they asked me to recreate this logo in vector: I added the color, outer glow, line weight on the name, changed the “catering” to “Catering, Inc.” and when applied to print I increase the line weight of the name to increase legibility. More to come for Panachè, as they team up with a local college cafe!